What the challenge looked like. It looks pretty similar to the concept of notched boxes, except the corners are now scooped and we only have to worry about one corner per box. So let's see how we can do it, how we can expand the technique to multiple corners, what issues we run into and how we can get around them with or without making browser support compromises. We can give this some dimensions or let its dimensions be decided by the content—it doesn't really matter. For simplicity, we're just setting a max-width and a min-height on it. We're also giving it an outline so we can see its boundaries. Well, it doesn't look too exciting... yet! So let's move on and make this square a disc by setting border-radius: 50% on it and give it a negative margin equal to its radius $r, so that its central point coincides with the (0,0) point (top left corner) of its parent box. We also set overflow: hidden on the parent box, so that whatever of this pseudo-element is outside the .box gets cut out. Note that when we also have text content, we need to set a negative z-index on the ::before pseudo-element and explicitly position it in the corner as we now also have a padding on the .box to compensate for the scoop. Now, let's move further and see how we can apply this concept in order to reproduce the design I showed at the beginning. In this particular case, the central points of the pseudo-element discs don't coincide with box corners, but are outside, in the middle of the space in between boxes. We use a wrapping flexbox layout on the <body> with the <header> really wide and with one or two <article> elements on each row, depending on how wide the viewport is. Landscape (left) vs. portrait (right) mode. If we have a single <article> on each row, we don't have scooped corners, so their radius is 0px. Otherwise, we give this radius --r a non-zero value. Let's now consider just the situation when we have two <article> elements per row (and of course a scooped corner for each because that's what's of interest to us). For the second <article> (second on the same row), we have the same value in the case of the vertical offset. For the third <article> (first on the last row), we have the same value for the offset along the x axis as in the case of the first one. For the final one (second on the last row), we have the same horizontal offset as in the case of the one above it and the same vertical offset as for the one to its left on the same row. This means the positions of the central points of the discs depend on the gap in between our <article> elements (this gap is twice the margin: $m we set on them), on the disc radius r and on a couple of horizontal and vertical multipliers (--i and --j respectively). Both these multipliers are initially -1. For the first two <article> elements (on the first row of the 2x2 grid), we change the vertical multiplier --j to 1 because we want the y coordinate of the discs' central points to be below the bottom edge, while for the odd ones (on the first column), we change the horizontal multiplier --i to 1 because we want the x coordinate to be to the right of the right edge. The above demo works in current versions of all major browsers and, if we can do with some repetition instead of using CSS variables, we can extend support all the way back to IE9. While this was a quick and easy cross-browser way to get the desired result in this particular case, we may not always be so lucky with this approach. First off, we need a pseudo-element for each scooped corner, so if we want this effect for all corners, we need to bring in an extra element. Sad panda. Secondly, we may not always want a solid background. We may want a semi-transparent one (which becomes a pain to get if we want to have more than one scooped corner), a gradient one (while we can emulate some radial gradients with box-shadow, it's a less than ideal solution) or even an image background (hardly doable with the only solution being to use mix-blend-mode which cuts out Edge support without an elegant fallback). And how about really large boxes for which the spread we've set is not enough? Ugh. So, let's explore other, more reliable approaches with various degrees of browser support. Flexibility and good browser support? SVG it! This is probably no surprise, but the full SVG solution fares best if we want something flexible and reliably cross-browser today. 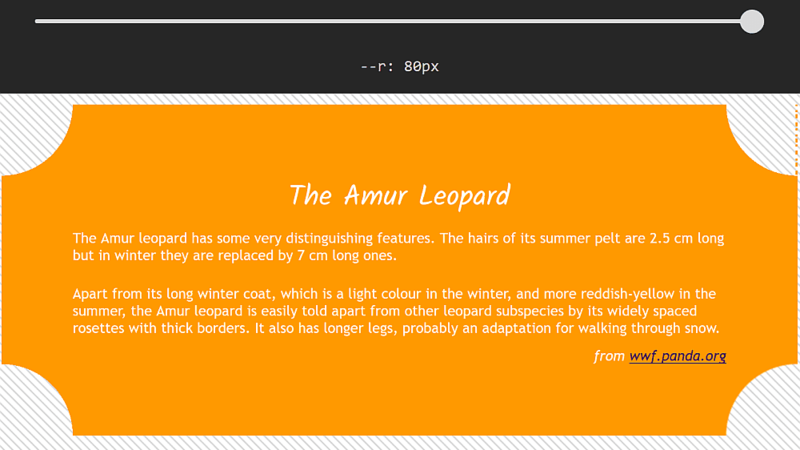 It's a solution that involves using an SVG element before the content of our box. This SVG contains a <circle> on which we've set a radius r attribute. Note that if we want to exclude one corner or more, we just don't clone it there. 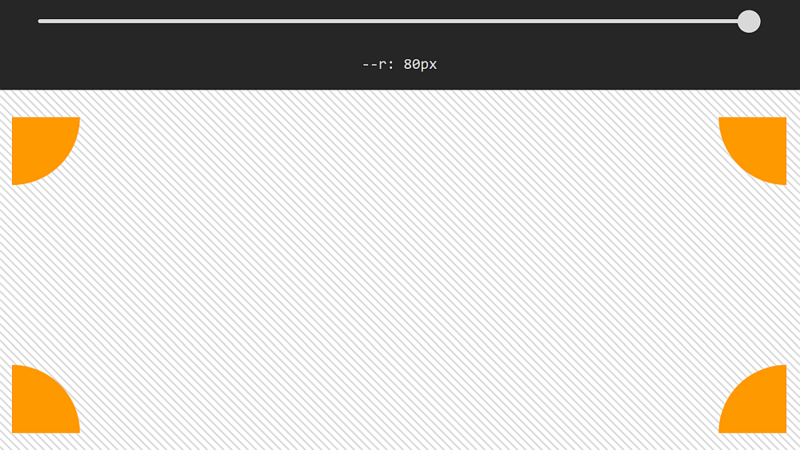 Of course, the fill of our background rectangle doesn't need to be a solid one. It may well be semi-transparent (as it is in the demo above), or we can use an SVG gradient or pattern for it. The latter would also allow us to use one or more background images. But I came here for CSS candy! Well, glad you asked! There are a number of things we can do here to shift the weight of the masking method from SVG to CSS. Sadly, none of these is cross-browser, but they simplify things and they're definitely something to keep a watch for in the near or more distant future. Note that setting an inline SVG mask on an HTML element only works in Firefox for now! 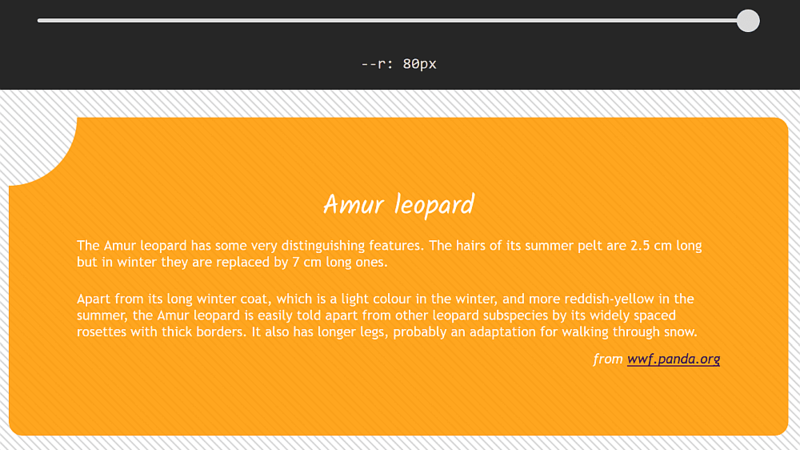 Version using CSS masking directly on our .box (live demo, Firefox only). This way, when we change the value of --r, both the scoop radius and the padding around the .box content get updated! Note that setting geometry properties for SVG elements from the CSS only works in Blink browsers for now! Version using a CSS variable for the <circle> radius (live demo, Blink only). While this would be cool, it's sadly not possible in practice in any browser at the moment. But the good news is we can do even better than that! 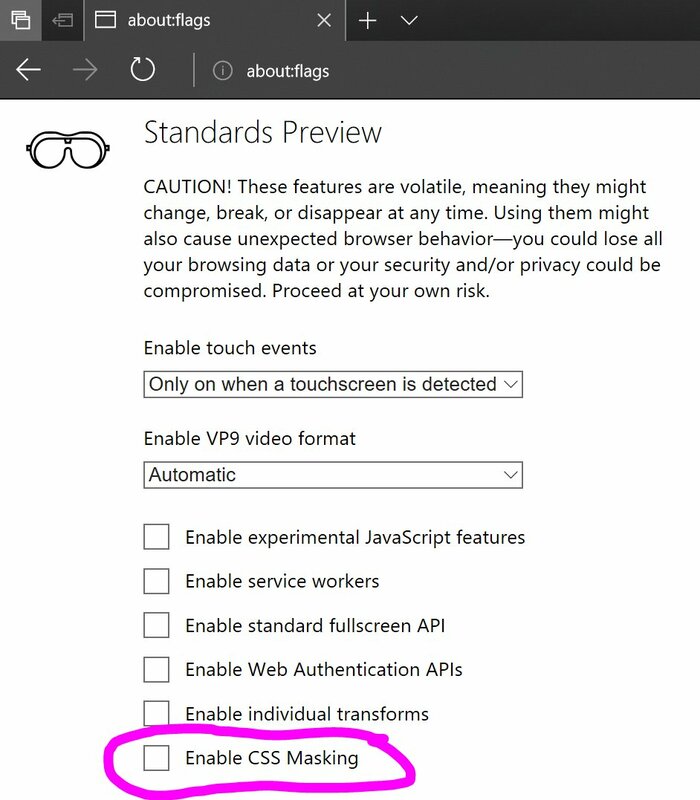 Note that CSS masking on HTML elements doesn't work at all in Edge at this point, though it's listed as "In Development" and a flag for it (that doesn't do anything for now) has already shown up in about:flags. Note that WebKit browsers still need the -webkit- prefix for the mask properties. That's insanely repetitive, either a lot of writing or a lot of copy-pasting, so let's see what we can do about that. First off, we use a CSS variable for the stop list. This eliminates repetition in the generated CSS. Result of the code above (live demo, no Edge support for now). Here, we're cutting out everything but the corners, which is the opposite of what we want. Result when using just one gradient (live demo, no Edge support for now). However, when we stack up all four of them (or just even two), we get a black rectangle the size of our box for the mask, which means nothing actually gets masked out anymore. Layering mask gradients (live demo, no Edge support for now). Our mask, split into four quarters (live). Note that WebKit browsers still need the -webkit- prefix for mask properties. But the big problem here is... the problem with division and rounding in general—our four quarters put together don't always manage to make up a whole again, so we end up with gaps in between them. Sadly, we may get gaps in between the four quarters (live demo). Increasing the mask-size for each gradient layer fixes the problem of gaps (live demo). But isn't there a more elegant way? Well, there's a mask-composite property that can help us if we set it to intersect when reverting back to the full size gradient layers. This is extremely cool because it's a pure CSS, no SVG solution, but the not-so-good news is that support is limited to Firefox 53+ here. Result using mask-composite: intersect (live demo). However, we at least have the non-standard -webkit-mask-composite alternative (taking different values!) for WebKit browsers. So that's a lot better than support for the final option we have when it comes to scooped corners. 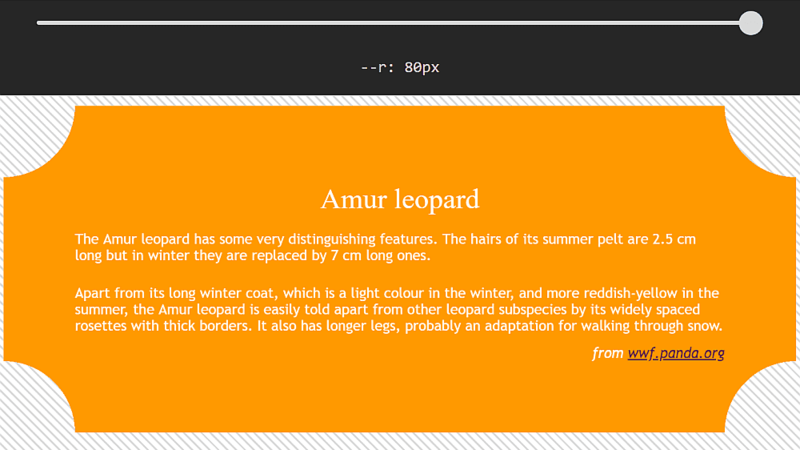 No markup vomit, no long gradient lists, just this very simple piece of CSS. That is... when it finally gets supported by browsers! There is a much easier way to do those box-shadow positions in the box-shadow technique. Instead of doing those super complicated positioning calculations, you can use the translate transform instead. Well… allow me to disagree. One, they’re not placed in the corners. They’re placed outside the corners at a distance $m that doesn’t depend on the dimensions of the box (so you can’t express it in % and mix it in the offsets) or on those of the scoop radius (so you can’t express it in % and mix it in the translation amounts). So you’d either have to use a calc() anyway or add in a margin (which would mean you’re using 4 properties instead of just 2 to achieve the same result). Two, using up transforms for initial 2D positioning is something that’s best to avoid whenever possible (there are valid use cases for it, but this is definitely not one), even now that CSS variables are supported cross-browser and they can make this less problematic. Thing is, you may want those scoops not to be circular, but modify their shape with something like a skew. But if you’re already using the transform for positioning, then you need to chain the skew to the translation. And if you want to animate the skew, then you need to have that translation chained in each and every damn keyframe – yuck! Three, you’re only offering an example for one corner. What about the others? If you want to write maintainable code that’s not bound to get fudged up whenever you make changes, you still need to come up with a formula that’s valid for all four corners, so you’re back to those computations, whether you’re putting it all in the offsets and saving up the transform property for when you might really need it or foolishly wasting it. If you have a unified formula for all corners, then you only need to make one change in one place later. If you think it’s too complicated to sit and think a little bit in order to come up with a unified formula, good luck with never ever making any mistakes when changing the same thing four times in four different places. I personally don’t like writing lazy and error-prone code. I’d rather sit and think a bit before I write the code and come up with a robust and efficient solution. Although a silly attempt, but I think this can also be achieved by using radial-gradient along with linear-gradient above it. Using this approach it can also be possible to use some linear-gradient as a background. Oh, yes, it’s definitely possible, but I chose not to include this in the article. First, because this is one approach that’s already been written about (Lea did an article on this back in… what, 2010?) and I’ve seen used in places and I wanted to focus on techniques I haven’t seen explained before (with me having the tendency to go into a lot of detail, I always worry articles will get too long for anyone to read anyway). Second because of rendering issues with gradients. And by rendering issues I mean both this (dammit, Chrome, can’t believe it’s still not fixed) and those gaps I have for the masking gradients as well. And while it’s not so bad in the case of the masking gradients because I can always use the background-size: 51% 51% trick… this trick can cause overlap in the case of semitransparent backgrounds. But it’s definitely a possibility if you use the non-sharp transition trick for the scoops and have a solid background or you know the dimensions of the element. Because then you can use just one radial-gradient() with a proper background-position that’s half the known width horizontally and half the known height vertically.